This gauge for FIP provides engine torque and rotor power turbine for turbine powered helicopters. Modified GPS FSX default "Garmin 295 and Garmin 500". 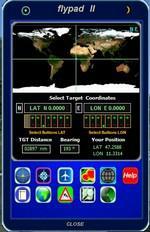 The amendments allow visualization 3D map, then with more terrain detail and the display of air traffic in the disply GPS. Soon after uploading the gauge package I realised that with just a little bit more scripting, I could make the gauge work for the 737 but also automatically adjust for other aircraft that operate with much higher pressure in the engine oil and hydraulic systems. Regardless I made the original to be a secondary EICAS screen with Philippe Verhaege's gauge as the 737-8 primary EICAS screen, this upgrade will make the secondary screen work for many other twin engine jets (though still in the 737-8 layout or as least as close as I can make it given the size limitations of a FIP). The EICAS Secondary gauge (for FIP) has been created as an addition to Philippe Verhaege's gauges in his gauge package named . This gauge package primarily provides a secondary screen for EICAS. Philippe's background EICAS image is slightly altered by giving it a border similar to a MFD screen and some elements have been moved very slightly as a result. The red arrow head that displays at the bottom of the FIP screen denotes the secondary EICAS screen can be accessed by pressing the down arrow on the FIP. The secondary screen dispays basic primary data from Philippe's original gauge, in the top right corner plus displays rotating or digital data for oil temp / pressure / quantity and vibration and hydraulic info. Fuel data is a replica of Philippe's work but can now be toggled between lbs or gals by pressing FIP button no. 6. For use in the Saitek FIP specifically for the FSX B58. It is an update of the BB58 gauge in the package and my package. Using this new package will require having downloaded these previous ones. This package radically re-works the original BB58 gauge. It contains a working auto pilot and fuel gauges similar to the BB58s. The AP gauge functions across two xml files, one primarily to control ALT and VS, the other for HDG with a range of misc features including AP NAV and APR modes. Other features include Nav1 and Nav2 audio buttons which include a small green light when a glideslope frequency is detected. Both LARGEg1 and g2 from have been modified to maximise the screen space of the FIP. The g1 gauge has also been modified by inclusion of a rudimentary glideslope indicator to aid in manual approach well before approach lights are visible. The above AP gauge enables auto flight down a glideslope using Nav1 frequency. The above gauges are designed for three FIPs stacked vertically to provide a layout roughly similar to the BB58 cockpit. The 5gaugeDisplay-2eng.xml gauge was included in the original package to cater for one FIP displaying all engine data. This package provides an updated version B containing the glideslope indicator. This set of gauges is for use in the Saitek FIP and has been developed specifically for the Baron 58 and variants but should work with other twin prop aircraft. There are 3 options- option 1. a pair of gauges for displaying on 2 FIPs (layout is similar to the fsx BB58 layout) option 2. One gauge for displaying only on 1 FIP (left and right eng needle on each of the 5 main instruments ) option 3. a pair of gauges for displaying on 2 FIPs with larger diameter gauges and more user interaction than in 1. above. 1,2, & 3 all have the 5 main engine instrumentation ( RPM, Manifild Pressure, Fuel Flow rate, Oil Temp and Pressure, CHT/EGT Temp.) Additional features are added .e.g Marker Beacon indicators plus indicator of left / right fuel tank selected for each engine, NAV 1 & NAV 2 with DME data. Option 1 & 3 also has fuel pump switches, alternator switches, starter buttons, cowl flaps and Amps (total load) gauge, and Battery volts gauge. Option 3 also has additional avionics data and avionics and battery switch buttons. All this enables the aircraft to be started from cold and shut down to cold. The avionics data is useful if you only have one Saitek radio panel. i.e. dont have to keep clicking / rotating switches all the time. This option also gives user ability to alter NAV 1 standby frequency and swap to active. With the 2 gauges in option 3 above plus my earlier FIP gauge containing a working Auto pilot and fuel levels / flaps and landing gear indicators (refer "Saitek FIP-AP Multi Fuel Gauges") there is everything required ( not the primary flight display instruments) for flying a single or twin prop aircraft displayed across either 2 or 3 FIPs. 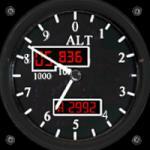 Digital/analogue counter drum equivalent altimeter. This version address some of the issues with badly implemented code introduced in v1.2. Press the kohlsman dislpay to type altimeter settings via keyboard; settings are updated automatically once typed, but can also be cancelled/reset. Should work fine in a VC.